This week, please welcome Lea! I'm Lea, I'm in 7th grade, and I like all ice cream. 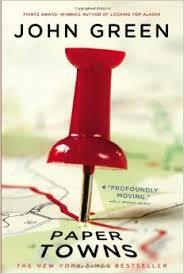 I read the book Paper Towns by John Green. I chose it because I really liked The Fault in Our Stars and lots of people recommended it. When they go look for Margo. If my friend needed something, I would help however I could. I would get my friend to read this by saying that it was really funny and suspenseful. It isn't for little kids or anything. I really like the cover. It stands out and makes you want to look closer. No, because the characters were very common - someone unpopular and someone popular who have a bond. That is interesting but it's used a lot and is getting boring. The Magic Tree House books remind me of this because people who care about each other get split up and try to find each other. Why did you write this and what was the idea based on?